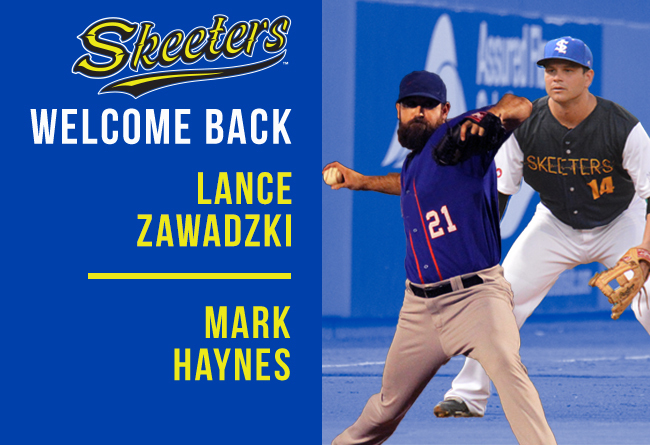 (Sugar Land, Texas, March 3, 2017) – The Sugar Land Skeeters announced today that the club has re-signed Atlantic League veteran infielder and former big leaguer Lance Zawadzki and right-handed pitcher Mark Haynes for the 2017 season. Zawadzki, 30, returns to begin his first full season with the Skeeters after joining the club last season in July. Haynes, who is also 30, returns as well after joining the Skeeters in September. After spending three seasons in the Atlantic League (2014-2016) with the Lancaster Barnstormers, Zawadzki joined the Skeeters last season and played a significant role in helping the club capture the 2016 Atlantic League championship. During the Skeeters 6-0 playoff run in 2016, he started all six games and batted .261 with one home run and four RBI. He solidified the Atlantic League Championship for the Skeeters after catching the final out in the last game of the Atlantic League Championship Series against the Long Island Ducks. Ironically, Zawadzki helped the Barnstormers defeat Sugar Land in the 2014 Atlantic League Championship Series, giving him two championships in the last three years. The power hitting shortstop has 88 career home runs, 167 doubles, 25 triples and 423 RBI in 958 games played. Lance earned Atlantic League All-Star honors with the Barnstormers both in 2014 and 2015. Zawadzki in 2003 was drafted by the Montreal Expos (48th round) out of St. John’s High School in Oxford, Massachusetts. He would later be drafted in 2006 by the St. Louis Cardinals (15th round) out of San Diego State University and again in 2007 by the San Diego Padres (4th round) out of Lee University (Tennessee) where he played in the 2007 NAIA World Series. Prior to his major league debut, Zawadzki had the first-ever hit at Petco Park with a double off the wall as a freshman for SDSU on March 11, 2004 against the University of Houston. Lance was also the first player from Lee University to reach the majors, playing in 20 games with the Padres in 2010. In his first at bat for the Padres he collected his first big league hit on May 2, 2010 against the Milwaukee Brewers. Zawadzki also played for Hall of Famer Tony Gwynn at San Diego State and played with Tony Gwynn Jr. while with the Padres. Sugar Land native Mark Haynes returns to the Skeeters after posting a 3.38 ERA in three games last season with the club. Haynes began his Independent League career in the American Association in 2010 with the Shreveport-Bossier Captains and played two seasons. In 2012 he joined the Laredo Lemurs and pitched four years. Last season prior to joining the Skeeters, he played for the Kansas City T-Bones where he posted a 5-2 record in 40 relief appearances, a 3.86 ERA with 15 saves. In his seven seasons pitching for Independent League teams he has pitched in 206 games (19 starts) with 28 career saves. Haynes was a three-year starter and baseball letterman at Austin High School (Sugar Land, TX). The right-hander would later play for Rice University (Houston, TX), where he was primarily a middle reliever. Injuries limited Haynes his first two seasons at Rice (9 game pitched) but he would appear in 42 games for the Owls from 2009-2010. In his four years at Rice he was 3-0 in 51 total games (3 starts) with a 4.11 ERA in 92.0 innings pitched.